Melt butter in a heavy, large saucepan over medium-low heat. Add flour and cook about 4 minutes, stirring constantly with a wire whisk. Gradually whisk in hot milk, about one cup at a time, and cook, whisking constantly until sauce is bubbly and thickens (about 5 minutes). Remove from heat; add Cheddar cheese, stirring until cheese melts. Stir in hot pepper sauce and ground black pepper. 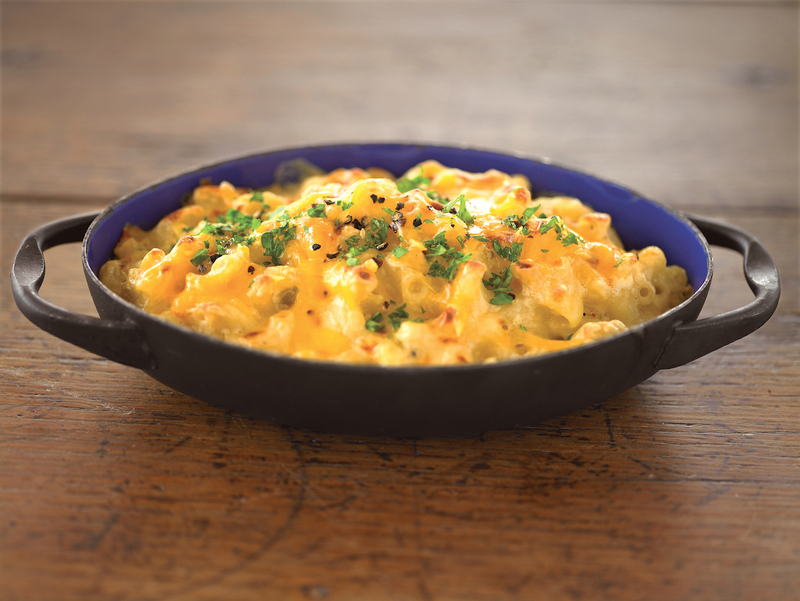 Combine cheese mixture and cooked macaroni in a 13 x 9 x 2-inch baking dish coated with cooking spray. Pour cream over the macaroni and cheese. Combine bread crumbs, Parmesan cheese and chili powder or hot paprika; sprinkle over top of macaroni mixture. Bake at 375° F. 30 minutes or until hot and bubbly. Garnish with parsley and serve.